This was our first stop along the river. 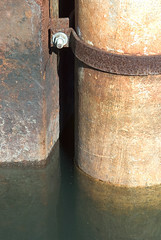 The boat lauch and water level station provided us a vast selection of images to record. 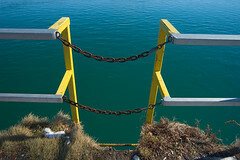 This ladder leads to a rather cold swim (as if the current weren't enough of a challenge). 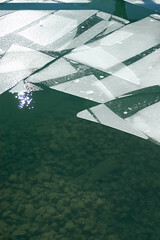 The reflections of the seawall at the boat slip are interrupted by the small pieces of ice. 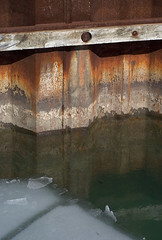 The rock base at the boat slip is visible as the ice breaks away. 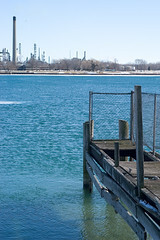 These old piers were fenced off and without question as to why. 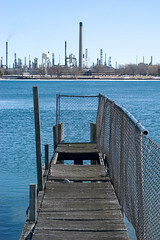 This lovely view across that same decaying pier looks upon one of Canada's river-front plants. 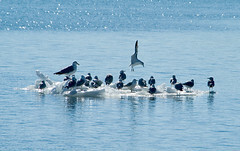 These Seagulls enjoyed their own little cruise aboard one of the floating ice chunks.